The summer crops are at the end of their harvest. At the farmer’s market, zucchini, eggplant, tomatoes, green beans, corn, peppers, and okra are abundant. My garden is teaming with okra and a fabulous late harvest of green beans. Many northerners have never had okra before. It is definitely a southern veggie and generally fried in cornmeal or pickled. mmmm. Okra is also great stewed with tomatoes. I have oodles of green beans as well from my garden right now. I decided to add these two together in a fabulous side dish this week. You could also add zucchini or even sausage to make this a one dish meal. Serve over rice, couscous, or quinoa. Heat oil in skillet over medium heat. Saute onion until translucent (about 5 minutes). Add sliced okra, searing the cut sides. This will seal in that oozy okra juice. Cook for 5 minutes to 10 minutes or until okra is slightly browned. Add minced garlic and sauté for 1 minute. Add tomatoes and remaining ingredients. 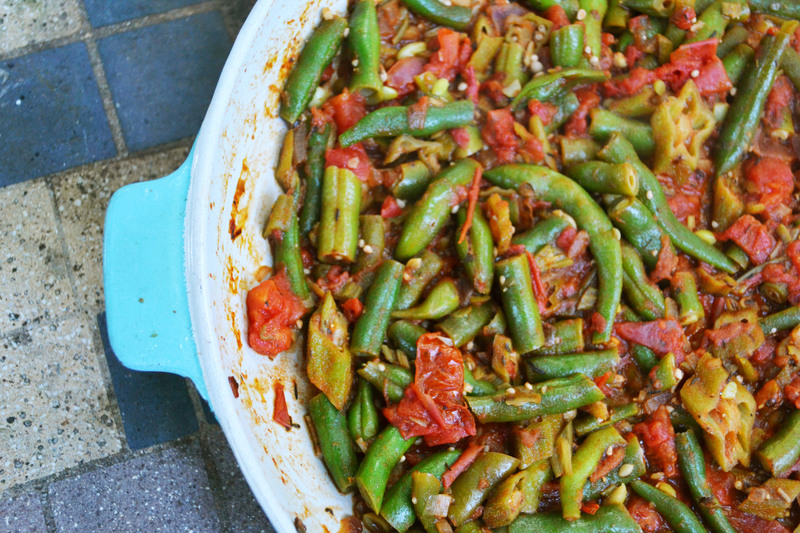 Cook for 10 to 15 minutes covered until okra and green beans are tender but not mushy. Stir every free minutes. If mixture becomes too dry, add water as necessary. Remove from heat. Add salt and pepper (fresh ground preferably) and cayenne (or tabasco) to taste. Serve as either a side or over rice. To make this a one pot meal, add shredded chicken, sliced polish sausage, or andouille chicken sausage to the end of the cooking stage.